Extraordinary Ministers of the Eucharist assist the celebrant/deacon with the distribution of Holy Communion at weekend Masses and other liturgies. Sufficient spiritual, theological and practical preparation to fulfill their role with knowledge and reverence is required. This ministry is open to all Baptized and Confirmed Catholics who are at least sixteen years of age. The ministers assist the priest and deacon so that Holy Communion may be distributed in a reverent and orderly manner. Those called to this ministry receive sufficient spiritual, theological and practical preparation to fulfill their role with knowledge and reverence. 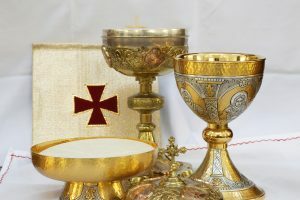 All ministers of Holy Communion should show the greatest reverence for the Most Holy Eucharist by their demeanor, their attire and the manner in which they handle the consecrated bread and wine. Training is provided as the need arises. To apply for being an Extraordinary Minister of the Eucharist, please download and complete the form and return to the administration office, or complete the online form below. Unfortunately, this online form will not deliver if you enter an @aol email address below. If you do not have a non @aol email address you will need to call the office at 330-534-1928 to sign up or return the completed form. Thank you.